One of my older sisters (did you know I have six?) is finally expecting a girl! She has four darling boys and, as much as she loves them, she is ecstatic to finally have a sweet little lady join their family. We've been talking on the phone about once a week going over her nursery ideas and it's been so fun to think about decorating a girl's room! She's been waiting so long and I hope my turn comes someday. After we talked today I made her a room board using several of the items she already had or was ready to purchase. 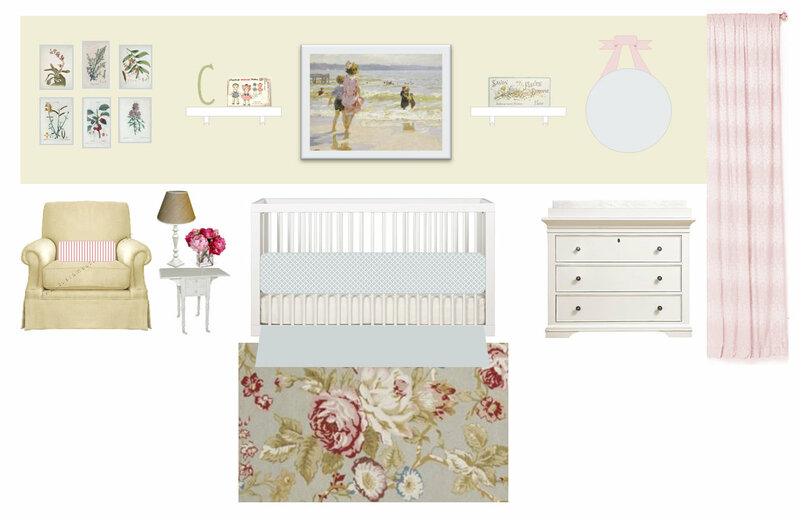 She already has a white crib, a white dresser/changing table, a white bookshelf (not pictured), a glider rocking chair and an antique sewing table which she'll use as an end table next to the chair. She wants to use this pretty rug from Ballard Design as a starting off point as well as this Edward Potthast Seashore painting. She also found the perfect bedding that's a beautiful "silvermist" quilted bumper with a soft, linen skirt of the same color. She's going for an English seaside look (hence the artwork) and wants to paint the walls a light sand color. My ideas involved printing off several botanical prints from the New York Public Library to put in these IKEA frames and hang on one wall. I also thought some pretty white wall shelves would look nice flanked on either or both sides of the painting. To put on the shelves - a letter (the "C" is just a guess), some vintage doll patterns and this pretty hanging board from Layla Grace. I also suggested a seagrass lamp shade to go with a white lamp base she already has, a round mirror hung with some pink ribbon and perhaps a subtle pink striped lumbar pillow for her rocking chair. She doesn't want too much pink but a few accents are pretty much necessary in a little girl's room. I peronally go for a more bold look (like this or this - my favorite nursery in the whole, wide world) but that's not my sister's style and I can appreciate her love for traditional, feminine design. What kind of look do you go for when decorating kids' rooms? Bright and modern or more soft and classic? Please oh please, where are those curtains from??? I am a long time reader but I don't think I have ever left a comment. I love this post. Honestly, I love ALL things babies and nurseries at the moment!! We are expecting our 3rd and we actually find out tomorrow the gender of this little blessing!! Thanks for the great ideas and pictures. I have been looking for botanical prints...so thanks so much for the link!!! And you can print them?!!?!! Oh, and I forgot to ask...where did she find the bedding??? Keri Beth - the curtains are from Anthropologie but I messed with the color just to give my sister an idea of what would look good. In real life they're more of a light coral and cream. If you're still interested, they're the "atomic age" curtains. I think they're very pretty. Beth - yes! You can print the NYPL pictures online. They have a print button and you can even print them at a high resolution. It is amazing! I don't know where she got the bedding but you should check out www.laylagrayce.com. Lots of pretty things that are similar to this style. Thanks for the link to the New York Public Library site! It is amazing!! I love how you put everything together! It looks fabulous! What program did you use to do your room board? I need to re-do my living room and never thought of doing something like this. (I'm kind of clueless when it comes to decorating.) And the NYPL prints...who'd have thought? You definitely have an eye! You're favorite nursery is stunning! I have retro alphabet cards that I planned to hang and never got around to it...maybe I'll put them in the playroom. My nursery style is to include at least one bright color. My daughter's nursery has bright pinks, orange, yellow, teal, and green, as well as light pink and brown. It is based on the pottery barn "Brooke" sheet pattern. I bought some large sheets and used the fabric to make additional things for the room. We were very limited in decorating because our landlords won't let us paint the pale peach walls. I got a bright pink lamp shade and pink sheers to go behind the drapes and the light makes the walls look pale pink. I like the design you did for your sister's room. Very pretty and feminine.